This creamy wash off mask, speads out smoothly when applied to skin and dries out fast but retains its consistency without cracks. Easy to apply and washes off with ease, it unclogs embedded debris including blackheads and whiteheads from pores and reduces their size. 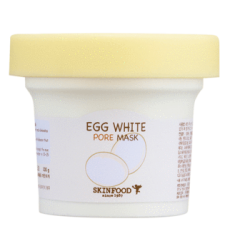 This mask contains albumin from white eggs that constricts pores, firms and smoothen skin. A simple spa in your own convenience! After your double cleansing (oil-based and water-based cleansers), spread ample amount to dry face, avoiding eyes and lips. Let it sit for around 10-15 minutes. Rinse thoroughly with lukewarm water and pat dry. Follow it up with your normal skin routine: toner, essences, serum, moisturizers, sunscreens etc. And if you exfoliate, make sure you use a sunscreen at daytime, since exfoliating removes the skin's natural barrier in protecting the sun, making your skin more sensitive to sunrays.